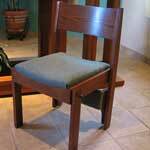 For maximum flexibility and practicality, the unique design of Marshallok Chairs cannot be matched. 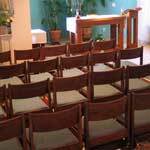 You can put their strength and beauty to work in place of pews, for choir seating, or as additional seating wherever needed. 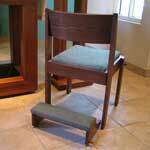 And, as with all Marshall products, only the finest oak is shaped into the uniquely contoured frames of these chairs. 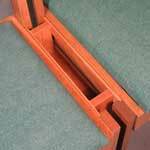 Sturdy spline nail and brace construction, the added strength of a biscuit between the rear leg and frame, plus top quality foam and upholstery, add extra comfort and durability. 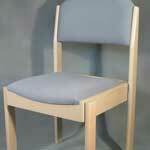 The Marshallok 3001 chair has a padded, upholstered flat seat with contoured padded back. 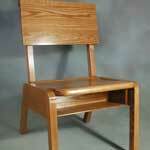 Various seat and back combinations can be configured with Marshallok chairs, including a solid contoured wood back, a contoured solid oak seat, or a true hand woven rush seat. 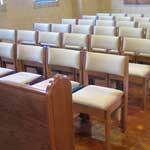 The Marshallok 7001 chair is a solid hardwood chair designed to be used with our solid hardwood pews. 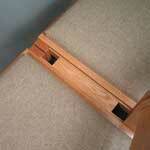 When placed side by side in rows, they form the appearance of a wood pew. 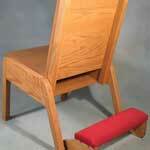 Available with an open back or closed back, and other options such as a fold up kneeler. 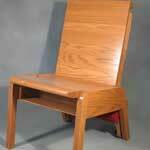 The Marshallok 2001 chair has a contoured, padded seat, and contoured, padded back. 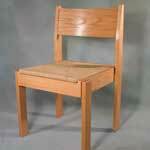 This chair can incorporate numerous seat and back combinations, included a solid hardwood contoured seat and back. 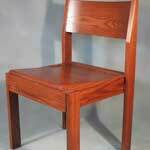 Marshallok 2001 chair shown with optional solid hardwood contoured back. 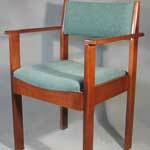 Interlocking bookracks, solid wood interlocks, or radial pivots can gang chairs together into straight or curved rows. Web Design by Implied By Design LLC.